Concise and user-friendly, Easy Mandarin Chinese is designed for anyone who wants to learn Mandarin Chinese whether on their own or with a teacher. This language learning book introduces the learner to all the basics of the Chinese language and teaches practical daily conversations and vocabulary. It enables users to begin communicating effectively from the very first day and it's compact size makes it a great tool for travelers or business people looking to learn Chinese on the road without giving up on any content. 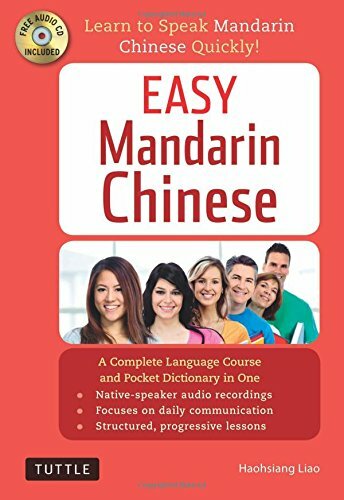 This Mandarin language learning book includes: Useful notes on the Chinese script, pronunciation, sentence structure, vocabulary, and grammar Sections covering greetings, requests, idiomatic expressions and common situations Cultural information about Chinese etiquette as well as do's and don'ts A glossary of the most commonly-used Mandarin Chinese words and phrases An enclosed CD-ROM with many hours of native-speaker recordings of the dialogues, vocabulary and exercises.